Out on the fairway, Frank Reed (Patrick Allen) calls for a two iron from his caddy, Jackson (Victor Maddern). Then a four iron but as he's pondering his choice for the next shot, Jackson points out a man investigating the bunker alongside the thirteenth green. Reed stands up and orders, '303'. Jackson hands him a rifle and Reed coldly kills the man then resumes his game. Jackson is searching the man's flat when Mrs Peel arrives, looking for Steed. He escapes after a brief fight and Emma runs into Steed when she gives chase. Steed tells her the flat belongs to a fellow agent called Ted Murphy, who was found dead in an alleyway. He'd been working on routine surveillance of scientists and obviously stumbled on something that wasn't routine! Mrs Peel finds golf score cards, all stopping at the twelfth hole, and a brand new set of clubs as well as a ball with the club's logo. They visit Craigleigh Golf Club, where they see Reed setting off for the course with Dr. Adams (Peter Jones), one of the scientists Murphy had been keeping an eye on. They alight from Steed's car and are stopped by the club professional, Jerry Collins (Francis Matthews), who tells them it's members only for the weekend as there's a tournament. 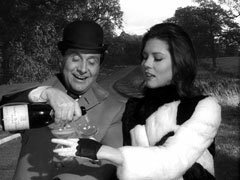 Mrs Peel smiles disarmingly and informs him they are both paid up members, as of yesterday. He frowns as Steed and Emma head for the course. They beat Reed and Adams to the first tee and Steed hopes to be asked to form a foursome and get off on a nice, friendly basis. He is about to tee-off when Reed stops him, arrogantly ordering him out of the way as they are due to tee-off at 3 o'clock. His plan foiled, Steed leaves Emma to play after them solo while he snoops around the club. After Emma tees off, Jackson emerges from behind a golf cart and drives off. Steed enters the club house and finds Murphy's name has been struck out of the membership list. Collins enters with Colonel Watson (Hugh Manning), arguing about playing schedules. They see Steed in the practice range and chat to him, Collins instructing Watson on his grip after introducing them. Steed fishes for reaction, first by mentioning Murphy then Reed's 'punctuality'. When he says he's heard the thirteenth hole is hard to finish, he gets a bite from both men. Mrs Peel meanwhile has followed her quarry to the thirteenth, herself followed by Jackson. She sneaks up to one of the bunkers flanking the green as they head for the opposite one. Before she can investigate, Jackson's cart comes crashing down into her bunker and she leaps out of its way. She returns to the club house and tells Steed how they disappeared in less than a minute. He's concerned about the loss of Adams, who's a leading missile scientist, and goes to search the staff room. Captain 'Buddy' Waversham (Donald Hewlett), the oleaginous club captain, pounces on Mrs Peel and introduces himself. She coolly endures his feeble jokes, but "I wouldn't mind giving you a stroke or two, on or off the course" takes the cake. Reed returns from the course and Steed hides when Jackson brings in Reed's clubs. They depart and Steed finds the .303 rifle in the bag and bullets for it in the tee holder. A golf ball rockets in through the window and narrowly misses Steed, deflected by a pin flag. 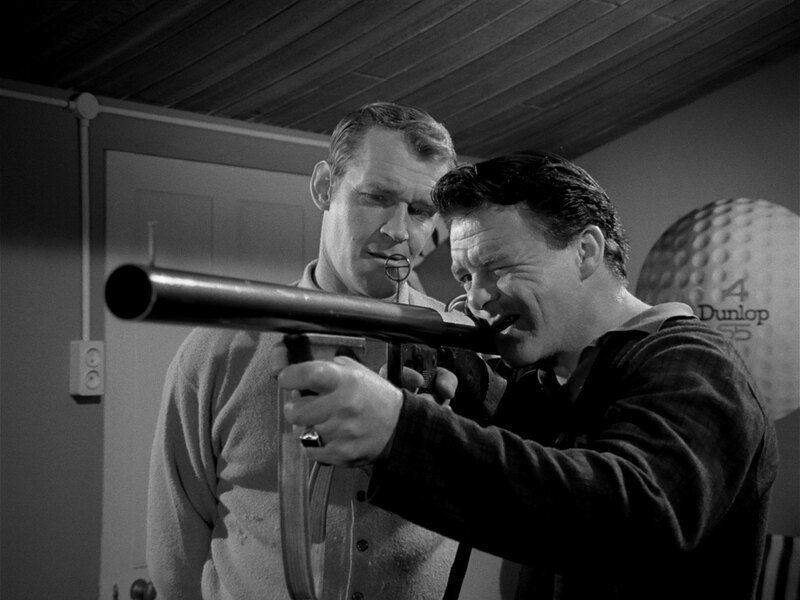 Collins suddenly appears and demands to know why he's there; Steed smiles and asks him to return the ball to its owner, noting a drive that could bend the metal flag would require a strong arm. Waversham meanwhile has told Mrs Peel who Reed is, and says he thinks he's a radio technician. Steed returns to the club house and shows Emma a bullet. Fearing Adams has been abducted, they ask Reed where he is but Dr Adams enters and wonders what the fuss is about. Steed discovers the signs of the struggle in the bunker but when they go to inspect Collins' body, it has disappeared. They head back, Steed entering the bar and announcing he was taking a moonlight stroll around the course, to the consternation of all assembled. Watson has the schedule for the tournament and notes that Steed and Reed will tee off at 11am, which anger Reed. Mrs Peel meanwhile finds the golf cart and discovers a star map under the seat. She's interrupted by Reed and Jackson entering. Jackson tells Reed to tell the boss that Adams has returned then informs him he killed Collins, who was snooping about the green. Jackson brandishes an odd mini-bazooka which fires gas-propelled golf balls. Reed notices the star map on the table and turns on Jackson, giving Emma the chance to escape - not before she's heard them say that their plot concludes tomorrow afternoon. Reed tells Jackson he'll beat Steed so he can play Adams at 3pm; if he doesn't, Jackson is to kill Steed. 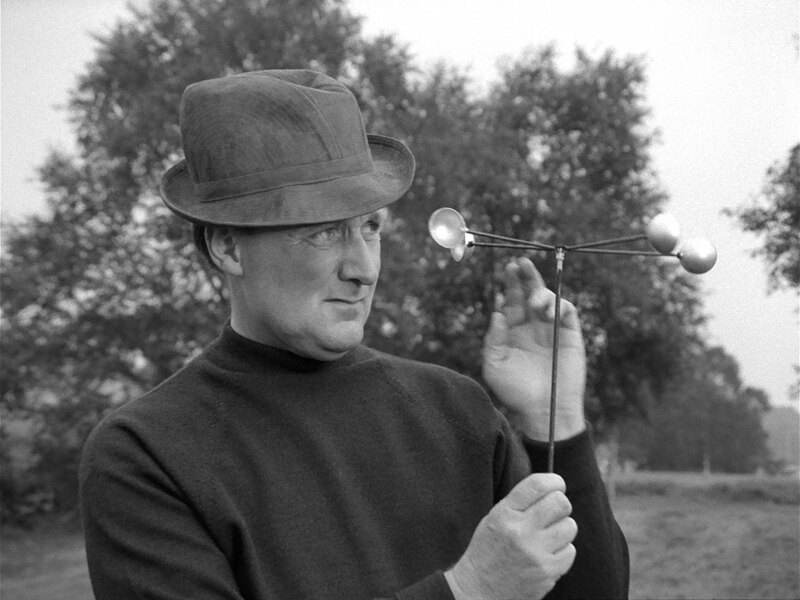 Steed and Reed tee-off but not before Steed pulls out a wind gauge then a triangular plumb gauge to judge the course and conditions. Reed cheats and distracts Steed mid-swing but Emma is out on the course and drives Reed's ball deep into a tussock with her foot then switches another ball for Steed's. When Steed goes to look at it, she appears from the bushes and tells him, "I'm your fairy godmother and I want you to win the game" - she explains about Adams at 3pm. When the players get to the green, Steed discovers Mrs Peel has deposited his ball in the hole, giving Steed the hole by three shots. Steed wins easily and he and Emma are wondering what Reed will do as a result when Jackson fires his golf ball gun at Steed, knocking him out. Steed comes to in the club house, Emma smirking at his pessimism in choosing a hat lined with chain-mail. She shows him the star chart, which marks a new star between Leo and Orion. Watson enters and asks how Steed is then says he'll scratch him from the tournament. Steed protests that he's perfectly fit, despite Waversham's and Watson's protestations. On the course, Adams is worried about not reaching the thirteenth by 4pm. Jackson tells him to make sure Steed puts first on the twelfth and Steed won't trouble them again. Professor Minley (Norman Wynne) from the Greenwich Observatory returns Mrs Peel's call and tell her the "new star" is Vostik 2, a Russian communications satellite. It's been passing over Britain for the last month, passing over Surrey at 12pm and 4pm - today is its last orbit. Minley supposes to use the satellite one would need television transmission equipment and the co-operation of the Vostik technicians. 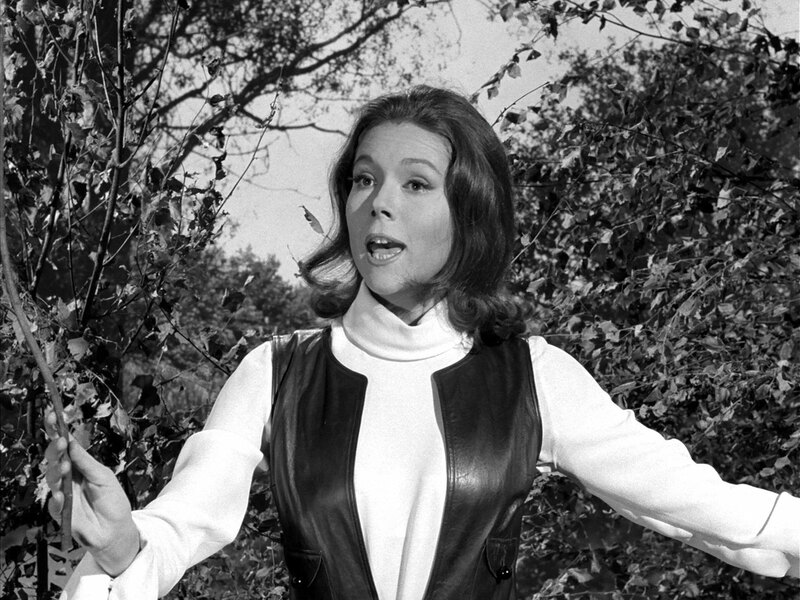 Emma sets off for the course where Steed is slowing his game by trimming grass with nail scissors. 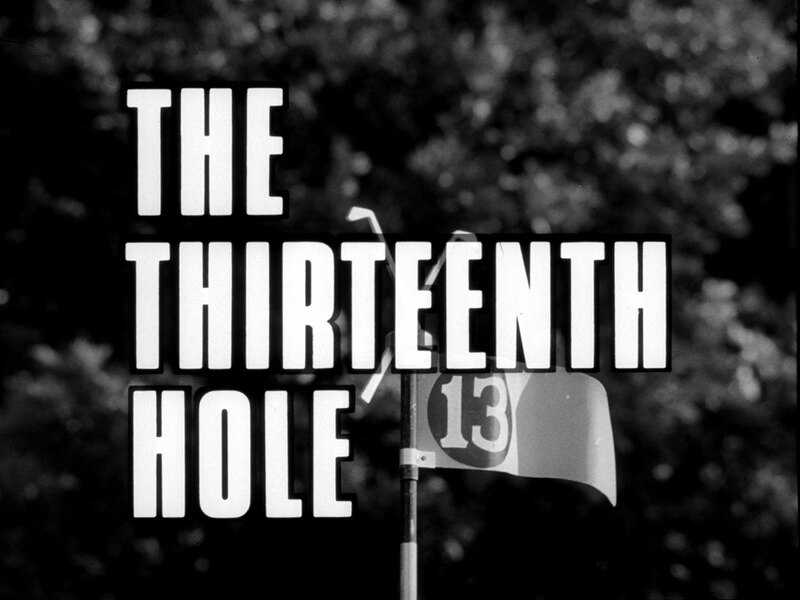 She is kidnapped by Reed and taken to the thirteen hole at gun point. Reed opens a door hidden in the bunker and they enter an underground... errr... bunker where Colonel Watson is in charge. Collins' body is still lying under a bench in the corner so she's chained to a chair. Watson lowers a periscope and shows her Jackson, planting a sensitive landmine in the cup of the twelfth hole - and Steed is approaching... Steed putts and comes up just shy of the hole, Adams trying to be nonchalant while hiding in the bunker. Watson turns on the equipment, explaining that Adams can divulge his secrets and, because of the camera, demonstrate their application in the minutest detail. A Russian scientist (Richard Marner) appears on the T.V. screen and is told there will be a slight delay. 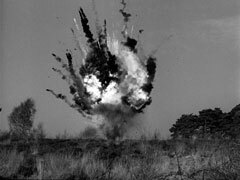 Steed spots the mine and rushes over to a small bunker then plays an improbable snooker shot, using a second ball and his putter as the cue to explode the mine safely. When the dust settles, Adams is surprised to find Steed in the bunker beside him. Steed grabs his lapels and marches him over to the thirteenth where they enter the bunker. The Russian sees Steed first and shouts a warning - Steed pushes Adams ahead of him and deals Watson a blow with his club. He then turns on Reed and strikes his shooting arms with the putter before he can shoot. Jackson enter the bunker and joins in, Mrs Peel hitting him with her chair, now held above her head. Steed then hurls his knobkerry through the television screen, making the Russians flinch. Watson takes the opportunity to escape and runs out. Steed follows and, finding the Colonel has a healthy lead, starts hitting golf balls at him. He finally manages to knock him out, turns to Emma and suggests they finish the game. He asks her what her handicap is and she hold up her handcuffed hands. The Avengers depart, Emma chiding him for "not doing it in one". Steed manages to pop the champagne cork and says it's a question of the wrist action. He pours two glasses and they drive away - in one of the golf carts.